iPhone and iPad sales pushed Apple to quarterly records for both sales and profit during the just-completed holiday season, the company announced Wednesday. But Mac sales dropped from last year’s numbers. For the company’s first fiscal quarter of 2013, Apple posted revenue of $54.5 billion and net profit of $13.1 billion. Revenue rose 17.7 percent from the 2012 first quarter, while profit was flat year-over-year. Apple earned $13.81 per share, down half-a-percentage point from the $13.87 it earned in the year-ago quarter. 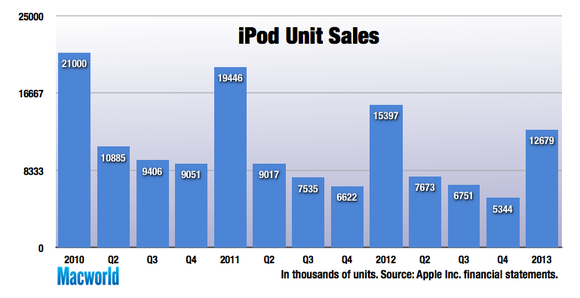 Note that Apple’s figures for 2013 came in a 13-week first quarter; the 2012 first quarter ran 14 weeks. Chief financial officer Peter Oppenheimer noted that Apple’s average weekly revenue was $4.2 billion for the just-completed quarter, compared to $3.3 billion per week last year. Oppenheimer also pointed out that the holiday quarter included major transitions in Apple’s iPhone, iPad, and Mac businesses, as new products hit the market. “No technology company has ever reported these kind of results,” Apple CEO Tim Cook told analysts during a Wednesday conference call. Apple’s quarterly performance was in line with Wall Street expectations. Analysts were looking for sales of around $54.7 billion for the quarter and earnings per share of $13.42. Oppenheimer credited the “tremendous popularity” of iPhone 5 for driving Apple’s phone business—a not so subtle slap at rumors of sluggish iPhone 5 sales. Breaking with Apple’s typical practice of not addressing rumors, Cook did dismiss reports of iPhone order cuts. Apple executives touted the iPad’s use by businesses and government agency. Specifically, Oppenheimer noted that Barclays, the financial services provider, had rolled out 8,000 iPads to its workforce during the quarter, “making it the most successful IT deployment in Barclays history.” State, local, and even international governments are also deploying the iPad, he said, including 10,000 iPads by the Swedish government and 5,000 in the port system of the Netherlands. “We believe our Mac sales would have been much higher” without those constraints, Oppenheimer told analysts. Specifically, Cook noted the iPad line continues to provide “the mother of all opportunities” for Apple: Research suggests that people who buy an iOS product as their first product will be more likely to buy other Apple products going forward. The iPad mini builds on that trend, Cook added. Apple made brief mention of its Apple TV offering, noting that it sold more than 2 million settop boxes during the holiday season quarter. That’s a 60 percent increase from the prior year. Revenue from Apple’s retail effort was $6.4 billion—an all-time high and a 5 percent increase over the 2012 first quarter. The company says that revenue is largely due to iPad and iPhone sales. Updated at 2 p.m. PT with Apple’s guidance for the second quarter of 2013 and to correct the percentage growth in iPhone sales. Updated at 2:05 p.m. with comments from Tim Cook. Updated at 2:09 p.m. PT with comments from Peter Oppenheimer. Updated at 2:20 p.m. PT with more Mac sales information. Updated at 2:28 p.m. PT with more iPad information. Updated at 2:37 p.m. PT with iPhone data. Updated at 2:50 p.m. with more information throughout the article. Updated at 3:05 p.m. PT with retail store information. Updated at 3:08 p.m. PT with Tim Cook comments on cannibalization. Updated at 3:42 p.m. PT to include Apple TV sales figures.